Blowfish for Hangovers is a new over-the-counter drug and effective hangover relief product. As you get highly intoxicated this holiday season be prepared! Blowfish is a new remedy that is an FDA regulated drug specifically designed to treat the major symptoms of a hangover, with effervescent tablets that are dissolved in water and taken the morning after a big night out. 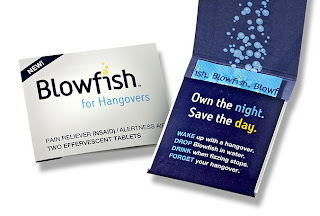 Blowfish addresses multiple hangover symptoms at once - headache, upset stomach, and fatigue. The effervescent delivery system helps rehydrate, and works fast because the ingredients are already dissolved. Aspirin treats headache symptoms, caffeine gives you a boost to get up and get moving, and a neutralizing agent helps settle stomachs. Each dose of Blowfish contains 1000 mg of aspirin (a maximum-strength dose) and 120 mg of caffeine (about as much as a cup of coffee). This combination is recognized by the FDA as an over-the-counter drug that is safe and effective for treating the symptoms associated with a hangover. To use Blowfish, simply dissolve two tablets in 16 ounces of water and drink. If symptoms return or you start to drag later in the day, Blowfish can be taken every six hours (do not exceed 8 tablets in 24 hours).